The enormous mass movement that has essentially overthrown Czechoslovak communism rose up with amazing speed. By the last week in November millions of people had participated in demonstrations across the country. Yet as recently as October 28--Czechoslovakia’s independence day--dissidents could bring only 10,000 people into the streets. These brave souls had scarcely unfurled their pro-democracy banners before truncheon-wielding police were chasing them through Prague's winding Gothic lanes. Three weeks later throngs of hundreds of thousands of people were routine in Wenceslas Square. In a matter of days they brought down the Communist leadership and dispatched the Party toward permanent oblivion. The long-suffering dissident community deserves much of the credit for the dramatic turnaround. But news reports have largely overlooked the role played by the students. Hundreds of students from Charles University and other Prague colleges were clubbed by police at a November 17 march marking the 50th anniversary of the Nazi murder of Czech student demonstrators in 1939. The regime's decision to knock heads was a monumental blunder. Milos Jakes, the Communist Party boss, hoped it would frighten the students back into apathy. But the dramatic liberalizations in the Soviet Union, Poland, Hungary, and especially East Germany had primed the Czechoslovak public for rapid change, as had hints of intensifying Soviet pressure on the hard-line Czechoslovak regime to reform. The zeal with which security forces bloodied unarmed students shocked Czechoslovaks more than any other event since Soviet tanks rolled over the Prague Spring reforms 21 years ago. It shattered the passivity that had long frustrated dissident organizers. "This is the start of the finish of this government," one man shouted prophetically during the violence. The awful parallel between the regime's violence against student demonstrators and that of the Nazis exactly 50 years earlier created an immensely powerful emotional rallying point. The next day young Praguers were mobilizing for a student strike, calling for mass protests and a nationwide work stoppage, and fanning out across the capital with handbills. 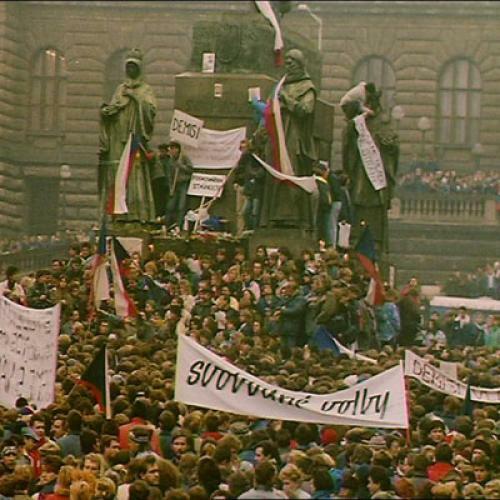 It was the students who finally cast of the legacy of timidity and fear left by the Prague Spring, and who bridged the considerable gap dividing oppositionists from the public. The snap founding of Civic Forum, the new umbrella opposition group, just two days after the police beatings signaled clearly that members of the disparate activist community had at last pulled together. They had emerged from a period of soul-searching over strategy with a will to seize the moment and an unsuspected mastery of coalition politics. "Now it isn't a small, foolish group of so-called dissidents," said Civic Forum's leader, Vaclav Havel. "We are at the time of a real beginning of a real opposition movement in this country." From then on Civic Forum rode a tidal wave of popular discontent. In little more than a week, the democracy movement was transformed from a motley band of dissidents into an organized opposition--and more. "We're no longer the opposition," Michael Horacek, a spokesman, proclaimed during the stunningly successful general strike on November 27. "They [the Communists] are the opposition." In a region where history, seemingly frozen for four decades, now moves with unnatural rapidity, the evolution of the Czechoslovak opposition movement has broken all records. In ten days it achieved what Poland's Solidarity took nine years to extract: a commitment by Communists accustomed to jailing their critics to abandon the Party's monopoly on power. When the wave of protests hit on November 17, activists were mulling over their past and future. Their principal achievement, as veteran dissident Jiri Dienstbier said, had been preserving the moral will to resist: "We were passing a small candle through the darkness." The movement's major failing had been its inability to spark protest across Czechoslovak society. The massive demonstrations in East Germany seemed to cause only ripples in Czechoslovakia. As long as the "socialist certainties" of sausage and beer remained in ample supply, the conventional analysis held, the complacent Czechs and Slovaks wouldn’t join their East German neighbors in the streets. "In my opinion this society is completely destroyed," Ivan Lamper, an editor of a samizdat political magazine, lamented to me before the first mass rallies. "People want democracy but they don't want to pay for it." Dissidents bemoaned the lack of a central opposition organization and of an alternative political program. And they didn't seem to be closing the gap between the largely Prague-based intelligentsia, which guides the opposition, and the rest of Czechoslovakia's 15 million people. Many of Solidarity's leaders built their legitimacy as representatives through years of close contact with the masses. But the writers, artists, actors, and journalists of Czechoslovakia's opposition functioned mainly as a moral beacon for a demoralized society. As practical politicians, they were a bit inept. Of course, marginalizing the opposition bad been precisely the aim of the government's relentless campaign of harassment, jailings, and surveillance. It usually refused to acknowledge the opposition's existence. When it did, the dissidents were branded as creations of the Western media and human rights groups. Members of the Communist Party who had joined en masse to participate in the Prague Spring reforms bad been purged en masse after the 1968 Warsaw Pact invasion. They and other oppositionists who emerged later found themselves stoking coal, cleaning latrines, and the like. Their children encountered mysterious difficulties getting admitted to college. Their telephones and apartments were bugged. They lived under the constant threat of interrogation, searches, and jail. Police were assigned to them like case workers. Fear of such punishments limited the number of Czechoslovaks willing to join up with the intellectuals. Not surprisingly, the independent groups had to concentrate more on mere survival than on developing a political program. Both the problems and the strengths of the opposition were exemplified by Havel, the country's best-known dissident. A slight, soft-spoken playwright of enormous personal courage. Havel, spent five years in prison, where be nearly died of illness. His plays have been banned in Czechoslovakia. His prominence as an artist and his persistence against the state made him the symbol of dissent. Yet all along Havel was more a spokesman of conscience than a potential political leader. "I do not intend to take for myself the role of professional politician. I have never had that ambition," be said even as Civic Forum was formed. Some of Havel's fellow dissidents, though not questioning his pre-eminence in the movement, have pushed him to act more boldly. They criticized him sharply for advising the country's young people to avoid a pro-democracy rally in August after the government hinted that it could turn into another Tiananmen Square massacre. "Vaclav Havel is a man of good heart, a humanitarian," Petra Uhl, a prominent and often jailed dissident, told the Washington Post two months later. "The problem is he does not support any concrete political program. He is an intellectual to such a high degree that I don’t think he will be able to pursue one." Through the mid-1980s the sole preserve of open opposition was Charter 77, the renowned human rights manifesto signed by Havel and hundreds of others. The candle was being kept aflame, but just barely. But in the last two years the arrival of a younger generation of students and workers began recharging the movement. Free of their elders' defeatism, they acted out of frustration with the authorities' refusal to accept Gorbachev-era freedoms. They rejected the unwritten social compact by which the Communists filled store shelves in exchange for sullen acceptance of the regime's stifling orthodoxy. The new generation coalesced in more than 30 new groups and began to link up with the older dissidents. A group called the Czech Children, made up of activists in their '20s, joined in demonstrations for political freedoms and environmental protection. The John Lennon Peace Club grew out of an informal group advocating independent cultural activity and respect for human rights. And the pranksterish Society for a Merrier Present, armed with truncheons made of cucumbers and salami, staged mock police assaults on demonstrators in Prague. Some of the merry policemen later ate their truncheons. Independent activism spread in other directions. Widely circulated petitions called for the release of jailed dissidents and an open discussion of 1968. Demand grew for samizdat publications. Thousands of Slovaks flocked to Catholic pilgrimages with anti- Communist undertones. Former associates of Alexander Dubček, the ousted father of the Prague Spring's "socialism with a human face," formed Obroda, a self-described "club for socialist restructuring. " Dubček himself emerged from his partly self-imposed isolation as a low-level forestry bureaucrat in Bratislava, calling for a Czechoslovak perestroika in interviews with foreign newspapers, on Leningrad TV, and on the Voice of America. Finally, Havel became the publicly recognized leader of the opposition. Intent on making an example of him, the regime staged a harsh show trial in February for his role in pro-democracy demonstrations the previous month. Yet the Communists' vitriolic media campaign against him unwittingly heightened Havel's celebrity status. A covertly made tape recording of a secret speech by Jakes revealed that be felt Havel's jailing bad been a tactical error; Jakes suggested instead that police target less prominent dissidents whose incarceration would draw little notice abroad. From its inception, Civic Forum's role has been--to use Havel's favorite characterization--improvised. The Forum made a set of specific demands that those Communist leaders tied to the Warsaw Pact intervention step down, that an independent investigation of the November 17 police brutality be launched, and that political prisoners be freed. After the first mass protest. Forum representatives opened talks with the more reformist--and opportunistic-- prime minister, Ladislav Adamec, securing from him a pledge against further police or army intervention. Havel initially declined to urge people into the streets; that call came from students. Yet one day later he was encouraging a vast crowd in Wenceslas Square to keep up the pressure on the government. Any lingering hesitation to act bad been overwhelmed by the revolution from below. The Forum's "improvisation" was taking its cue from the action in the streets, not from the cooler deliberations of the Prague intellectuals. Yet as the mass demonstrations continued, Civic Forum's organizational skills radically improved. It was increasingly able to channel, if not control, the public outpouring. From its makeshift headquarters in the basement of the Magic Lantern Theater, it organized the later protests and led the general strike. Just as significant, it was able to halt the mass rallies after the strike in order to conduct power-sharing talks in a calmer atmosphere. It won the grudging recognition of the new Communist Party chief, Karel Urbanek, who replaced Jakes on November 25, as a legitimate negotiating partner. And the once-reluctant Havel, who still longs to return to the theater, seemed to find his voice--and to accept his political role--in the week-long national catharsis at Wenceslas Square. Havel and other opposition leaders originally conceived of Civic Forum as a Czechoslovak version of East Germany's largest opposition group, New Forum. It was to be neither a political party nor an alternative government. Just the same. Civic Forum quickly found itself pushed beyond negotiating the terms of a dialogue with the government to conducting one. Then the Forum abruptly decided to act as a political party, much like Solidarity did in Polish elections earlier this year. Forum leaders announced that they would endorse candidates to run against Communists next year, when Czechoslovakia holds its first free elections since the postwar Communist takeover. Even with the Civic Forum's shortcomings--above all its lack of workers' Representatives--no other group was in a position to use the people's power in the streets to wrest concessions from the government. Civic Forum leaders now see their group as a watchdog over the transition to democracy. The Czechoslovaks' disgust with communism is so pervasive that even the Party soon accepted the need for a transitional coalition government with non-Communists. It had become clear even to the Communists that their monopoly on power was now untenable. The goal of a coalition government, from the Forum's perspective, will be to secure fair, multiparty elections and constitutional guarantees of free speech, a free press, and freedom of association. After next year's elections the Forum may dissolve itself and let traditional political parties do their work. Some of those parties are already coining into focus, The Socialist Party, long a toady in the Communist-run National Front, switched sides and backed Civic Forum; it could become an electoral force of its own. The Democratic Initiative, an opposition group founded in 1987, is stepping forward as a Western-style liberal party. Non-collectivized farmers are planning to launch a party. And Communist reformers have formed a group called the Democratic Forum, which could conceivably break away from the Communist Party. Other parties will undoubtedly crowd into the field in the coming weeks. In the interim, the Forum will have to decide what its role will be. It must also develop a consensus program of starter reforms. (Wisely, opting out of the Warsaw Pact is emphatically not one of them.) And there is the immediate question of who will serve in a coalition government. Although the Forum was not insisting that its members be named to a coalition Cabinet, it was claiming a de facto veto power over those appointed. It promptly exercised that veto when Adamec, apparently restrained by remaining Communist Party conservatives, tried to weasel out of his promise to share power with non-Communists. On December 3 be announced a new Cabinet, in which only five of 21 posts were transferred to non-Communists and 13 of the ministers had served in the previous Cabinet. The opposition called another mass demonstration and threatened a second general strike unless the Cabinet was recast to reflect the Communists' loss of influence. Another improvisation, Havel and Civic Forum will undoubtedly be making many more of them through this exhilarating season of the Prague Fall. Thomas Omestad, associate editor of Foreign Policy, met with opposition and government figures in Prague during the November protests.